Free Shipping Included! Samsung SHAPE Wireless Audio M5 Speakers with Wireless Audio Multi-Room Hub, F-WAM570P by Samsung at DJ Luu. MPN: F-WAM570P. Hurry! Limited time offer. Offer valid only while supplies last. Samsung Shape Wireless Audio is an expandable system - now music can follow you anywhere in your house. Play one song in any or all rooms, or different songs in different rooms from any number of speakers. Wi-Fi and Bluetooth connectivity lets you send music from your library or favorite App straight to your AC powered speaker. 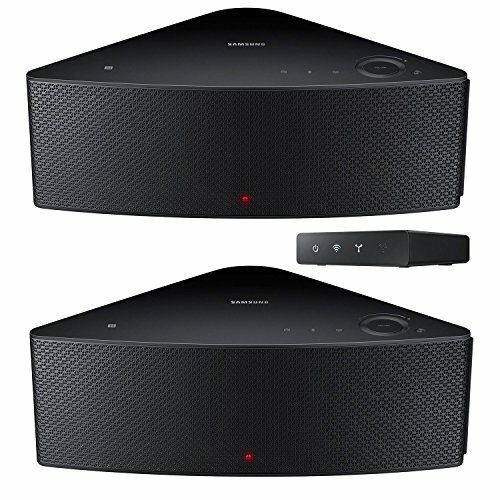 Control volume, streaming services and playlists, or switch to a speaker in a different room. Getting started is easy - plug in the speaker, connect your device via Bluetooth or Wi-Fi with the free app, and start listening. The unique triangular design fits your home; on a shelf, in a cabinet, or tucked into the corner. Use one speaker horizontally for stereo audio or a pair vertically for true left/right separation. However you enjoy your music, Samsung Shape Wireless Audio makes it happen. Stereo Sound: This stereo speaker can go anywhere, thanks to an autogyro that allows it to stand vertically. Paired in a left/right speaker setup, this system delivers incredible stereo sound. SHAPE Multiroom App: The App gives you total control of your music. Simply download the Android or Apple iOS App. Start the App, set up your speakers and select a song. Listen to the same music or different music in every room. Control the volume in one room or every room with your smart devices. Drag and Drop what you want to hear where you want to hear it. Simply drag and drop the music to the selected room for easy enjoyment.